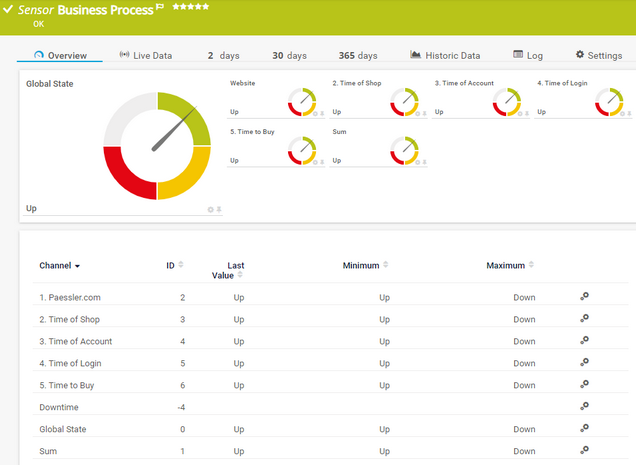 The Business Process sensor is a powerful and very flexible sensor that allows you to give a summary status of whole business processes while monitoring several process components. This means that you can create your very own and individual sensor with channels based on data from other sensors ("source sensors") that are specific to your network. The Business Process sensor does not show values in the "Downtime" channel because they cannot be calculated for this sensor type. If you want to process values from other sensors and you want to perform calculations with these values, for example, use the Sensor Factory sensor instead. Knowledge Base: How does the Business Process sensor calculate summarized sensor states? Enter a meaningful name to identify the channel. To add a new channel to the sensor, click the Enter Channel Name field, enter a name for the channel, and confirm with the enter or tab key. It might take several sensor scans until new channel names or changes to existing channel names become visible. Set a percentage limit to define when the sensor channel displays a Down status. Please enter an integer value. Default is 50%. This value depends on how many objects you feed into a business process channel. If a channel contains fewer source objects in "up" condition than the error threshold defines, this channel and the Global State channel of the Business Process sensor will show a Down status. All other sensor states will support the "down" condition (see the table below). For example, if you define 4 source sensors for a channel, an error threshold of 50% means that 3 source sensors have to be in "down" condition to set this channel to a Down status. So, 50% means that more than half of the source sensors must not be in "up" condition to set the sensor to Down. For more information, an illustration of the business process mechanisms, and some use cases of the Business Process sensor, see the table below and the Knowledge Base: How can I use the Business Process sensor? Set a percentage limit to define when the sensor channel displays a Warning status. Please enter an integer value. Default is 75%. 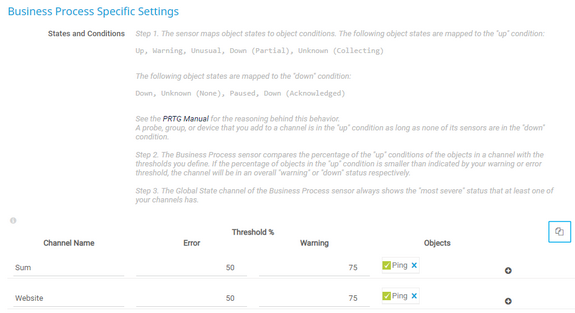 If a channel contains fewer source objects in "up" condition than the threshold defines, this channel and the Global State channel of the Business Process sensor will show a Warning status (and so the sensor status is Warning). For example, if you define 4 source sensors for a channel, a warning threshold of 75% means that all 4 source sensors have to be in "down" condition to set this channel to a Warning status. So, 75% means that more than three out of four of the source sensors must not be in "up" condition to set the sensor to Warning. Enter the objects you want to have in a channel using the + sign. This way, you can choose the desired objects from the device tree with the Object Selector. You can also start typing the object's ID, name, or a tag. PRTG then suggests the possible objects to be selected. You can add sensors, devices, groups, and probes to a channel. Each object you add is weighted equally, no matter if it is a single sensor or a whole device with many sensors. To give more weight to a specific object, add it several times. For example, add it twice to give double weight to an object, add it three times to give it triple weight. A probe, group, or device is in "up" condition as long as it does not contain any sensors in "down" condition . The Business Process Up and Down conditions are different from the normal PRTG Up and Down Sensor States. This is necessary for the Business Process sensor to be able to calculate summarized states and to show a calculated result for a whole business process. This table illustrates which sensor status leads to which Business Process condition. Reason: Why does a given sensor status correspond to a given Business Process condition? The monitored object works, so everything is fine. The sensor may show a warning, but the monitored object still works. This status is available in a cluster setup and is displayed if at least one cluster node reports the sensor as Up and at least one cluster node reports it as Down. With at least one Up report, the monitored object is supposed to be working and meets the Business Process Up condition. The sensor may show unusual values, but the monitored object works. The sensor still waits for more monitoring data to definitely decide about the sensor status, but so far the monitored object works. This PRTG internal status is visualized as Unknown in the PRTG web interface. The monitored object does not work. The sensor does not know if the monitored object works, for example because it has not yet received any data or because it has not received any data for a certain amount of time. The sensor has not yet received any monitoring data from the monitored object. This PRTG internal status is visualized as Unknown in the PRTG web interface. The monitored object does not work and monitoring has been paused, for example actively by the user, by inheritance, or by executed schedules. It might be convenient to exclude regularly or frequently paused objects from your business process monitoring, so you do not give more weight than necessary to a Business Process Down condition because of issues you already know about. The monitored object does not work and someone already knows. You find your configuration in the window that opens. Copy the marked text and paste it into the support form to send it our support team. Knowledge Base: How can I use the Business Process sensor?